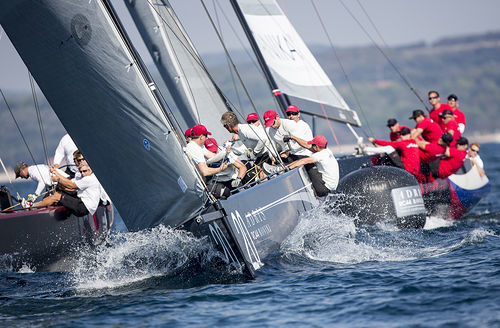 Four more races were held on the Adris RC44 World Championship’s penultimate day off Rovinj, Croatia. While up until this morning there had been a different winner in every race, today John Bassadone’s Peninsula Petroleum upset the apple cart, scoring three wins. The day far exceeded Bassadone’s expectations and he would be more than satisfied with a top five result from this World Championship. Instead Peninsula Petroleum lies second overall. Perhaps most odd about this regatta is that this week’s warm, light conditions have appeared as innocent and benign – although still more than adequate to provide good racing for the RC44s – as they have proved challenging for the crews. “Most important today were the starts,” Bassadone advised. In races two and three Peninsula Petroleum ended up locking horns with the Steve Howe-steered Katusha. In the first Katusha was early, luffed hard forcing Bassadone to avoid them, then won the pin, making Peninsula tack away or live in their dirty wind. In the second there was an equally intense scrap resulting in the two boats touching, but on this occasion Katusha was penalised, Bassadone’s team getting the upper hand – the difference between a 12th and a win. Today Peninsula Petroleum tried to win the pin in all four starts. The team’s high tempo Italian tactician Vasco Vascotto explained this was due to his feeling the left side of the course would pay with the wind not expected to veer beyond 200 degrees. Otherwise Vascotto was pleased – “we might drink a beer…” – but added it was important to keep calm going into tomorrow. Despite the leaderboard behaving as a rollercoaster ride yet again today, Chris Bake’s Team Aqua put in the most consistent performance of the 15 boats. She never scored lower than a sixth and goes into the final day with a healthy nine point lead over Peninsula Petroleum, which in turn narrowly squeezed Igor Lah’s Ceeref out of second place by just one point. 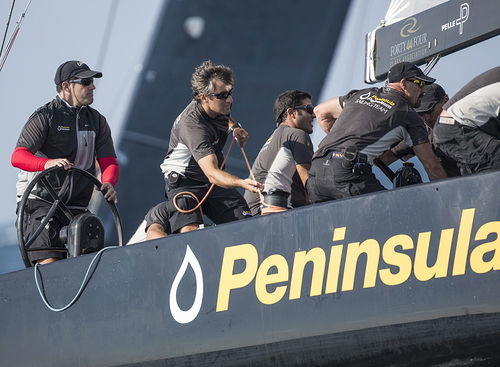 “The results are all over the place,” Team Aqua’s helmsman Chris Bake said. If Team Aqua can keep her performance as consistent as it was today then she will be in good shape tomorrow. 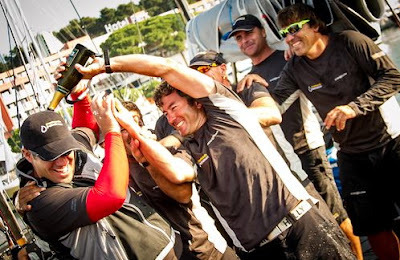 RC44 class newcomer Brian Benjamin admitted that his Aegir Racing didn’t have her best day. In race three they broke their boat’s retractable bowsprit, but after some nimble footwork by the shore crew this was replaced prior to the start of the final race. 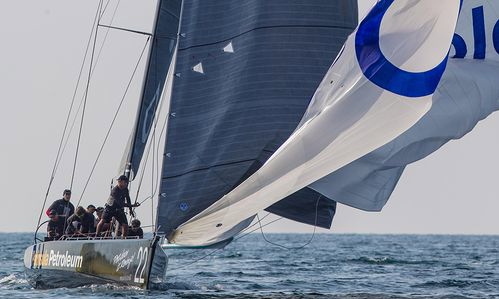 With Team Aqua holding a nine point lead going into the final day, Chris Bake’s team is holding true to form, quietly coming good as the regatta progresses. 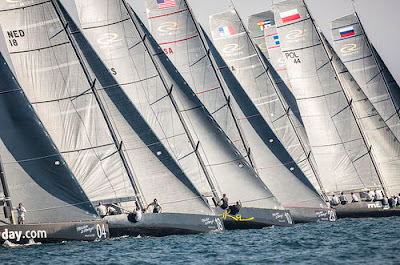 She is now in a strong position to defend her 2012 RC44 season championship title as well as win the World Championship.